Ramírez’s comments have been welcomed by Senate President and former Peace Comissioner Roy Barreras, for whom they represent a ‘change in tone’ from the FARC’s top brass. Santos’ Government, through Defence Minister Pinzón, however, has downplayed the importance of the video, arguing that the words of a ‘terrorist and drug trafficker who has consistently lied to Colombia’ cannot be trusted. Ex-President Alvaro Uribe has been equally dismissive of the ‘limitless cynicism’ of the rebel combatants, urging Colombians, in a video of his own, not to fall victim to the rebels’ strategy to win hearts and minds. A blow to the FARC? 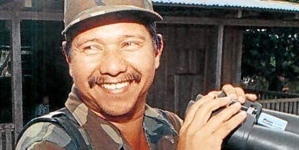 In November 2010 President Santos announced the death of alias Fabián Ramírez, the head of the FARC’s military operations in the south of Colombia, following a successful air-raid carried out in Caquetá. It was just four months into Santos’ regime and the president was now able to point to two major successes in his military campaign against the FARC, having in September already taken out the terrorist group’s military top gun ‘Mono Jojoy’. A whiff of doubt has remained about the veracity of Ramírez’s death, however. It proved impossible for the military categorically to identify his body among those fallen, and rumours quickly began to circulate that he had escaped to Ecuador. The sudden appearance on camera yesterday of course confirms these suspicions. It also invites us to the conclusion that the recent upsurge in FARC violence – which has been particularly evident in the south of the country – has been orchestrated by this supposedly dead commandar (either from within the country or across the border). There is much to suggest that ex-President Uribe is right and that the words transmitted during the interview form part of the FARC’s strategy to shift blame for the continued war away from themselves and on to the political class. During Ramírez’s broadcast he communicates clearly what public relations executives would call the FARC’s ‘key messages’. He argues that the greed of the political class is to blame for the failure in the search for peace. His analysis is that the army and their elected masters need the war to perpetuate in order to secure the continued flow of money (both in terms of US aid and through Colombian state coffers) they have grown to enjoy. 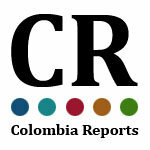 It is a simplistic view but it is one whose imagined truth resonates with elements of Colombian society. In spite of the FARC’s veil of innocence it is clear that little willingness to hold a truce and talk seriously of peace has been shown in the time since Santos came to power. Coincidentally or otherwise the well regarded independent media outlet, La Silla Vacía decided to publish today – directly following Ramírez’s appearance – the results of its analysis into the country’s security situation which show a significant increase in the number of terrorist incidents in the last year. La Silla revealed that attacks against infrastructure have shot up by over 100%, while ambushes or harassment of either civilian or the armed forces have risen by over 50%. This panorama is made worse when we consider the scenes of war witnessed throughout last month in the department of Cauca, and if we remind ourselves of the report by academics at the University of Sergio Arboleda in early July in which the FARC were reported to have returned to 50 of the territories from which in recent years they had been evicted. There is no doubt that despite the blows that President Santos has struck against the FARC and despite the dwindling numbers of plastic booted rebels willing to fight, there is a renewed energy and an apparent vigour to recent military campaigns. The hope is that this is a blaze of glory, the scream of a dying beast. President Santos argues that the dice has rolled for the last time and that following the deaths of Mono Jojoy – and more importantly – that of the overall leader Alfonso Cano at the end of the 2011, the FARC’s days are numbered. Santos’ analysis has led him to work with Senator Roy Barreras to create a legal framework for transitional justice should the FARC enter into peace talks and decide to demobilise. This framework was passed during the last session of congress and establishes the basis on which the crimes of former combatants would be judged. It also makes provision for certain elements of these illegal armed forces to enter the national political arena. Uribe and his followers have criticised the new law for appearing to appease terrorist groups but the government argues it is a necessary legislative step to permit a fruitful outcome to potential peace talks. Many political commentators have insinuated that such talks are already taking place, in private ‘under the table’. Although this is possible it is something that President Santos himself fiercely denies, and the actions of the FARC do little to suggest that – if they are taking place – a conclusion is anywhere near in sight. That there will be a negotiation in the future is a certainty, but it is a question of when, and more importantly, on what terms. The FARC’s recent upsurge in violence is designed to improve their hand when they get to the table, while the government’s insistence that the guerrilla group is on its last legs plays to the same strategy. The war continues while the peace remains phony. The appearance of Ramírez in this latest video must be seen in this context. His words are designed to attract sympathy, to play politics and to try to win an argument. The FARC are exploiting public scepticism in their political leaders to paint themselves as the victims; as the flag-bearers of truth and justice. The majority of Colombians will not be fooled by this, but there are sections of the society ready to side with anti-political forces, and Santos must ensure he does not lose a single heart or a single mind as peace moves closer.